Some things are just so obvious, eh? But first, some history. 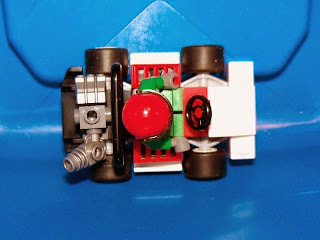 When I was younger, I built a bunch of little midget race cars. The basis was always the same; 2x8 plate with a 1x4 bumper front and aft, a 45° slope front and aft and a 1x4 plate for the spoiler. Sometimes I'd change it up a little but mostly they were formulaic. Imagine my delight when I saw this little set. The pieces are quite updated and the build is slightly different but the formula is there. Squee! The bag art didn't fully show the engine on the back but I'm impressed at what it is. One of those little Chima fists stuck on a travis brick looks kind of like a manifold. And a new space gun on the other side kind of looks like an exhaust. But the manifold only has three ports. These must be little tiny quarter midgets or something. Cool idea and I can see some variation on the theme. Maybe a fist on either side for an implied 6 cylinder and the exhaust in the back. A 1x1 round plate or tile on top for the air filter and now we're talking! But what really struck me was that despite the Octan livery, this thing looks like such a knock-off from a popular video game that it almost seems obvious. This, my friends, is how you rip-off a license. Create something under your own sub-brand that reminds the end-user so much of another property that lines are blurred. And yet there's no basis for a suit of any kind. I wonder how the K'nex execs or looking at this. Brand-washing? Or maybe they're hoping the confusion will help their properties. I'm sure TLG would deny any intention but someone in a back room has got to be sniggering over this. Let that set your bias for buying this. Available at Target in the US, other European locations at Brickset.com. Tomayto, tomahto? 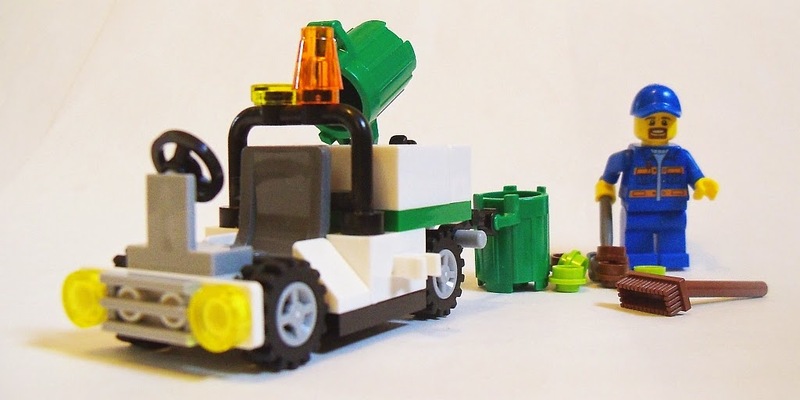 When I first read about a Garbage Truck polybag I thought it would be kind of cool. I envisioned a Creator style mini truck. Then I saw the pictures and realized it was a little glorified golf cart for the Parks and Rec department. Oh joy, another stripped down vehicle. But really, it's not that bad. Oh sure, the parts count is low and some features are mere tokens. For instance, the only thing protecting the driver's knees (or feet, I guess) in a head on collision is the steering column. But since he will probably only be driving on foot paths and across vast expanses of grass, it's likely the worst of his worries will be bicycles and baby strollers. Maybe an occasional tree. The coolness comes in with the garbage can mechanism. It's just a couple of droid arms hooked to a bar, but the whole setup allows for a (what can be imagined as pneumatic) system to keep our trusty city employee from filing an OSHA complaint. The arms can lift and lower the cans from the ground and even tip the full cans into the back end of the cart. Would that it was a dumper! I suppose there will be some manual shoveling out of debris otherwise. And speaking of debris, that's included as well. Not only do you get two lime green dots (hmm...) and two brown dots (total eww) but you get one extra of each! Woo-hoo baby, overtime! Plus an extra trans-yellow tile dot (where's ma hose?). Droid arms have become standard fare as extras, so it makes for a spare or central liftarm, or an extra grabby claw for picking up random garbage that the broom won't grab. As a test, I gave my 3y8mo old boy the set and told him to build the whole thing. He was really excited about the wheels but only got to putting the bed on when it got too hard without oversight. He put the man together and was happy enough rolling the chassis around in a child's fantasy world that I vaguely remember. These can currently be found in store at Target as an Easter promo. Only $3.49 (plus tax) makes for a great price point. With 48 pieces I would have expected $5. 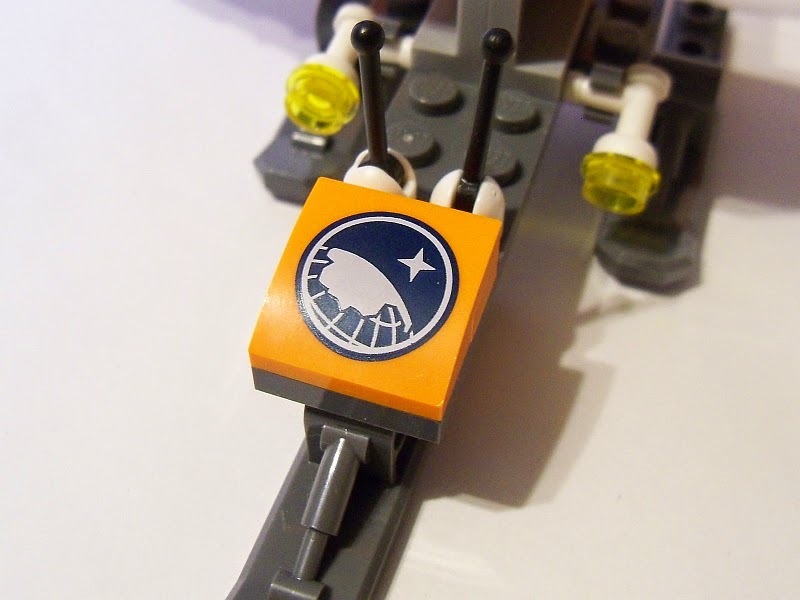 The wise BrickOwl tells me that these parts are worth at least $8-9. They've also got the previous TLG promo, Friends Mini-Golf with half the parts for $3.99. Go figure that economy. First, I am intrigued by the variety of Police subthemes that we have had versus the Fire themes. We've had Police, Wave Police, Forest Police, (Space Police; I, II, and III), and now Swamp Police. Meanwhile, we've had Fire, Forest Fire, and um... hm. No Swamp Fire? And no Space Fire? There's a missed opportunity. Swamp Police is a Louisiana bayou based theme aimed at catching moonshiners in their swampy like hideouts. Lots of pontoon craft and offroaders (even a half-track?) 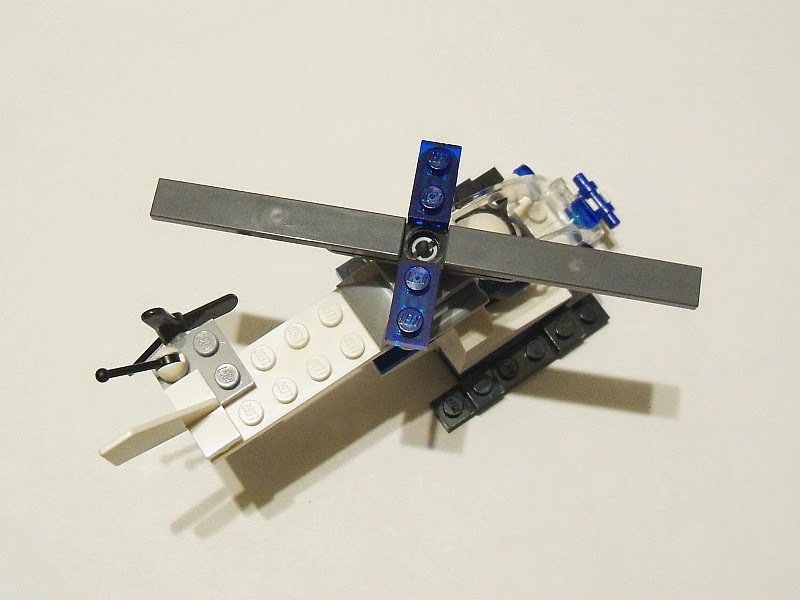 and a hovercraft. TLG needs to make more of those, period. I don't see a whole lot of bonus in the Swamp Police vs. the Forest Police. More mud maybe? What I do see is a chance to show off a new piece. The 2x2x2/3 round brick with side holes was introduced to us last year as part of C1-10P in the Star Wars Phantom set. It was decorated, but now we get it plain in both light bley and yellow. It works well as part of a pontoon. It sort of reminds me of the older octagonal bricks that were used as pontoons for the Hydronauts. Then again, I'm using about 22 of them in tan for a commission so of course they're fresh in my mind. I finally played good Dad and let one of the kids build a set with me. Mrs. Dagsbricks and the girls were off to an event so the boy and I had some bonding time. I pulled out the Driller promo polybag and his eyes lit up brighter than a Vegas sign. I poured out all the pieces and then dictated to him while he built the whole thing himself. He's 3-1/2, mind you. Duplo Schmuplo. The build is fairly basic but very sturdy. Given the color and function I was reminded of the less than stellar Mining Dozer though it's more similar to the Mining Quad. The overall construction reminds me of the Repair Lift. This one has the distinction of using the new black ice cream cone. 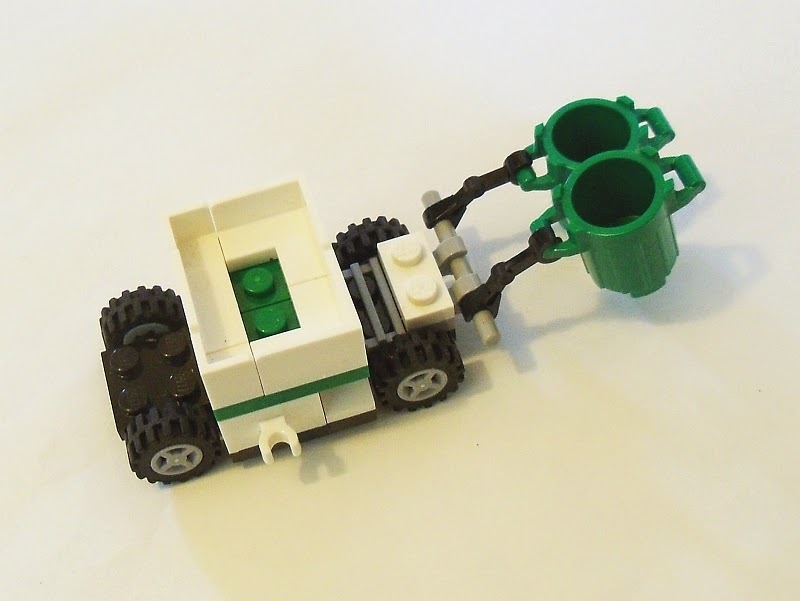 The premise of the vehicle is simple: break stuff. 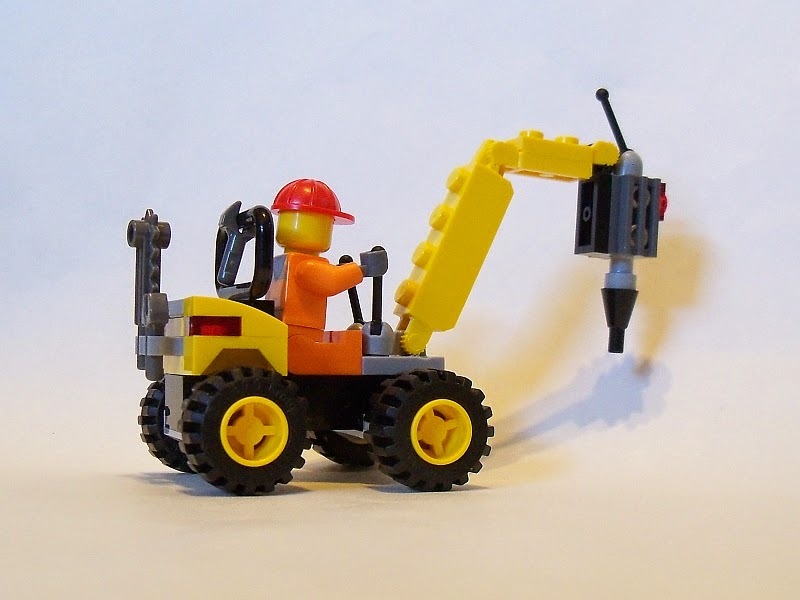 The driver operates a short boom arm that has a small engine on the end. The package art shows the black ice cream cone being used as a sort of hammer drill. 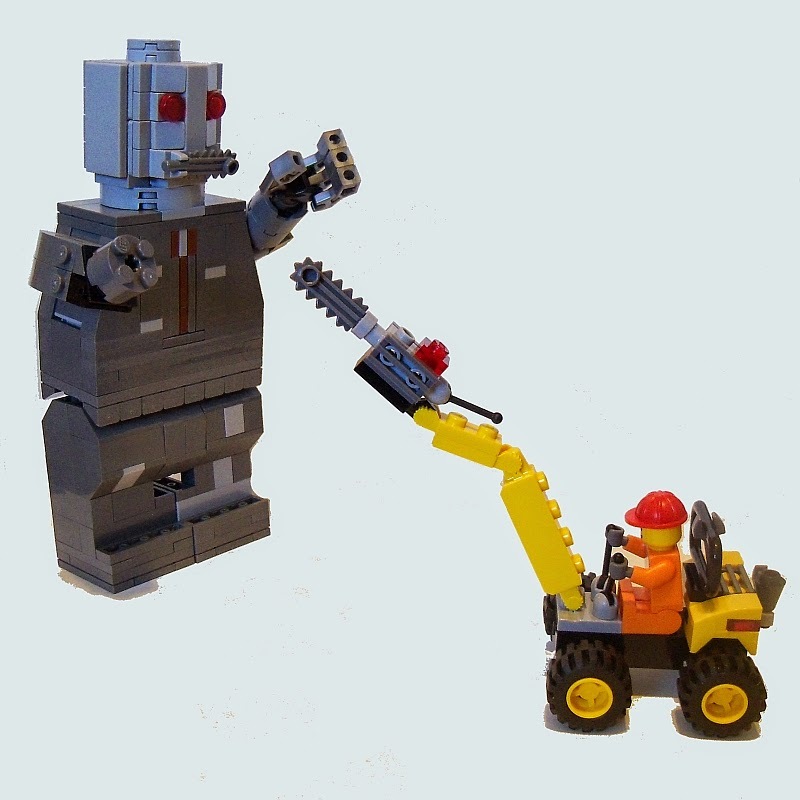 What they don't show you is that the set also contains both a chainsaw blade and a mechanical arm. The coolest part is that you can swap out the drill for the claw or the sawblade. Now you can break up concrete AND take down a monster zombie horde! I appreciate the new Demolition subtheme that's coming out but it doesn't quite grab me like the Mining subtheme did. These two sets would make a good blend though. I plan to add the driller to my mining layout for added rock breaking value. These are still available through Shop@Home when you purchase $35 or more. 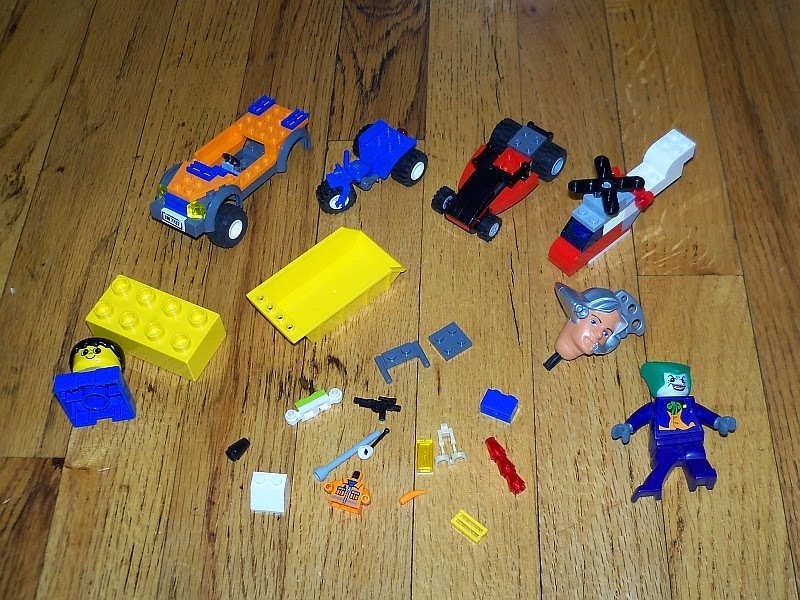 Apparently someone's mom thought that incomplete LEGO sets were no longer worth keeping. Completely misses the point of LEGO but whatever. I'm happy to be steward of the LEGO discards. Seems like City is strong this week. Some mostly complete sub assemblies. A strong showing from sets 30032, 7737, and some sort of helicopter that looks Creatorish but might be a Happy Meal promo. Speaking of Mickey D's, Nick's promo head makes a creepy appearance. For Christmas, Mrs. DagsBricks asked the 3 year old son what he would like to get me. Having recently played with my Arctic Scout surely played into his decision. 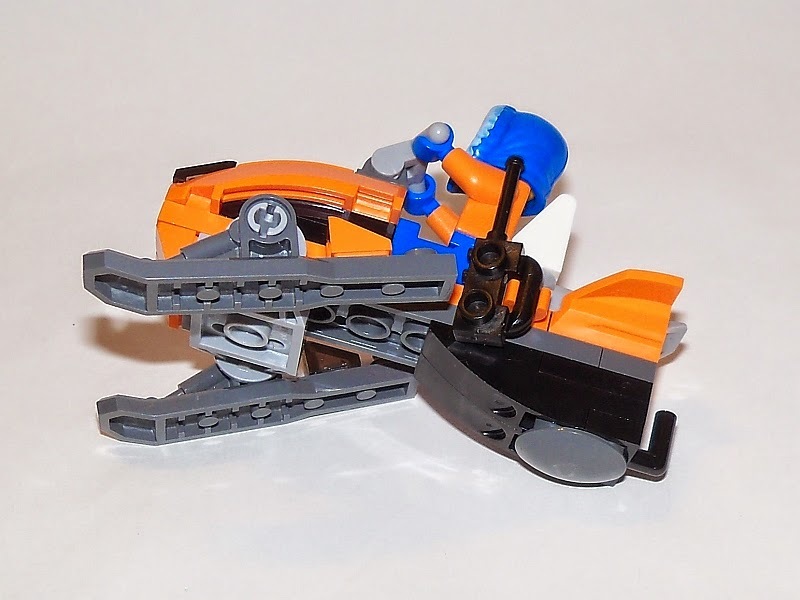 He figured the Snowmobile would make a nice gift for him. ;-) On Christmas day when I puzzled a little over the gift, the wife explained the back story. So of course the boy and the boy alone would help me build this. I'll try to keep this post from being a brag session about my son. At three and half years old, he assembled most of the set himself with little coaching from me. He had the instructions in front of him but I would describe the next part (orange wing, big white piece). He would then find it and attach it per the instructions, mostly correct. For the drag trailer, I just showed him the final picture and he built from that. Sharp, that one. I had not intended to buy this set for myself, nor would I after building it. As I've mentioned in the past, I'm not much of a City theme fan (though the Mining series was stellar). At a price of $6.99 and only 44 pieces (and only 3 extras! ), the price per piece count ranges up near 16c. There's nothing exclusive or large about this set either, mostly normal pieces. The rock in trans light blue is cool and the nose of the snowmobile is well done. But the rear tracked section is brick built with a boat stud underneath. 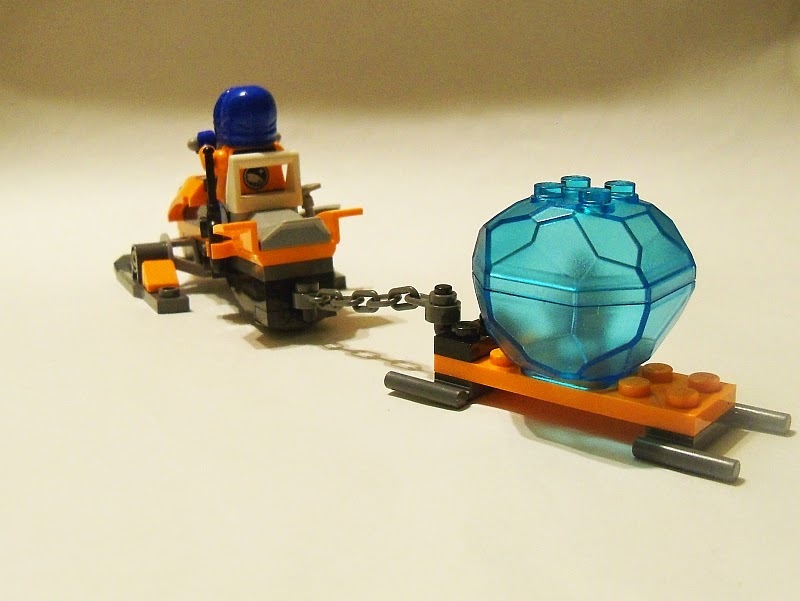 A tread like this set's bigger brother, 60033 (Arctic Ice Crawler) would have been more appropriate. Also, the handlebars are about a stud too high. The box art shows the rider standing (which I've rarely seen unless accompanied by a "Hey y'all, watch this!"). 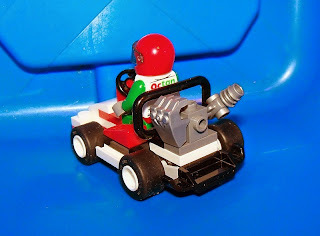 We seated him on the vehicle and his arms look like he's riding a Custom City Chopper. 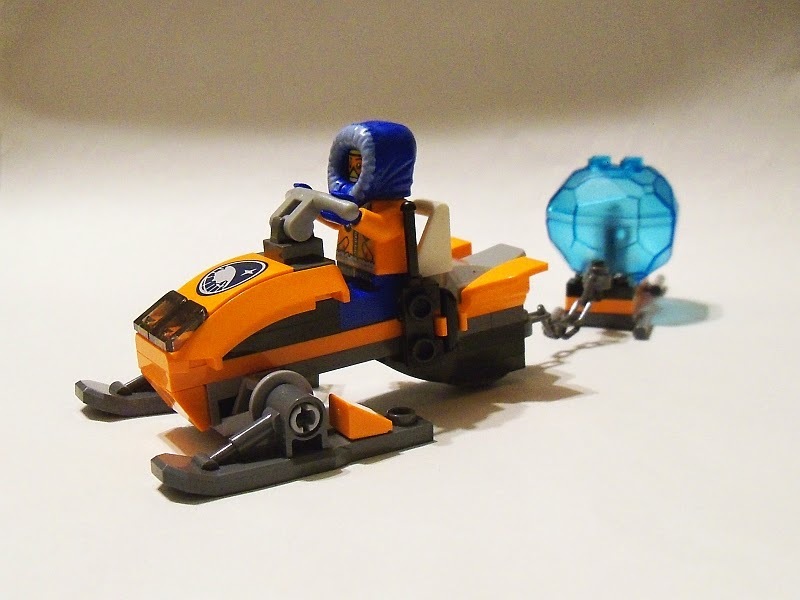 There's no denying that the Arctic Mining theme has some neat action going on. I mean hey, it's got Polar Bears eating Sled Dogs! But maybe wait until this one goes on sale or something. This little polybag (like so many others) evaded me for months. Finally one of my LUG buddies found them and bought one for me on speculation. His speculation was pretty good as I was more than willing to trade some other City polybag I had laying around. I was pretty thrilled to get this one. Something seemed odd about the set. After a while it struck me. While the rest of the Arctic explorers all come with fur lined hoods, this guy lacks one. Despite the fact that he flies through the air creating his own wind chill in an open cockpit aircraft. This is a bad case of hypothermia waiting to happen. Then the crash and the polar bear feast. Sounds like a major fail. There is at leat a little bit of fur printed on the front of the torso. Whether it's his uniform or from a polar bear escape, we are not told. Overall I would give the craft maybe a 3.5 out of 5. It's cute and fun but not highly sturdy and could have been designed a little better. My 3 year old son helped me build this craft but it kept falling apart with his play. He knows how to be careful and could be, but generally it will only tolerate gentle swooshing. There is one printed piece, an orange 2x2x2/3 double half bow. I rarely if ever see stickers in polybags so the printing should be expected. It has the Arctic logo on it which is four pointed star over the northern bit of the globe. It's a generic enough graphic that it could fit with several themes. 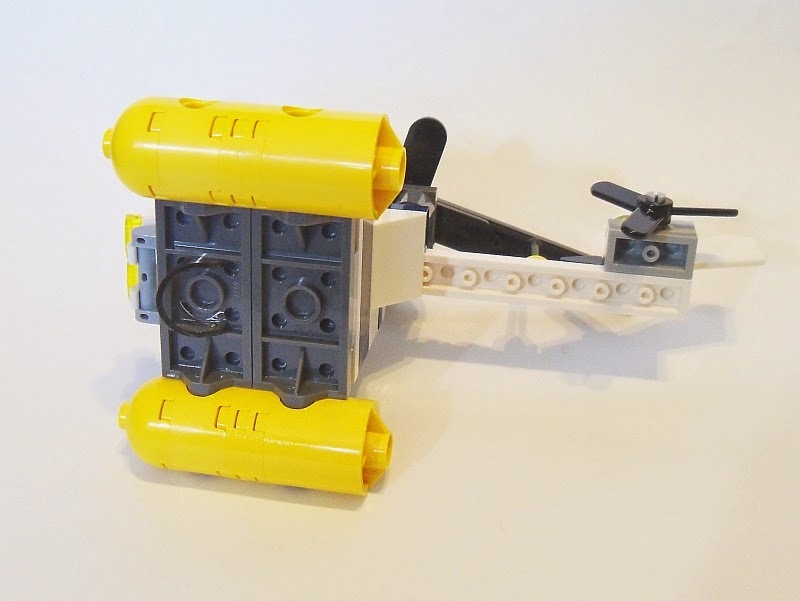 New with several other items are the landing gear. These are like the minifig footgear but way bigger. They are 1x6 in size with a Technic pin connector and two studs on the back. Because the front half is flared a bit, a minifig cannot wear them. 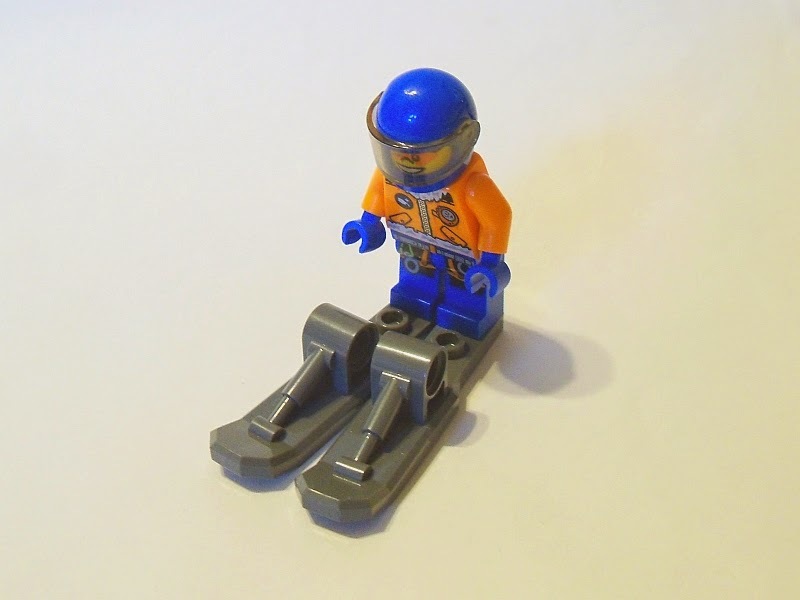 These same skis are used throughout the subtheme on several of the models. One last thing of note is an interesting connection that is rarely used. A 1x2 brick is stuck to the underside of a 2x plate. 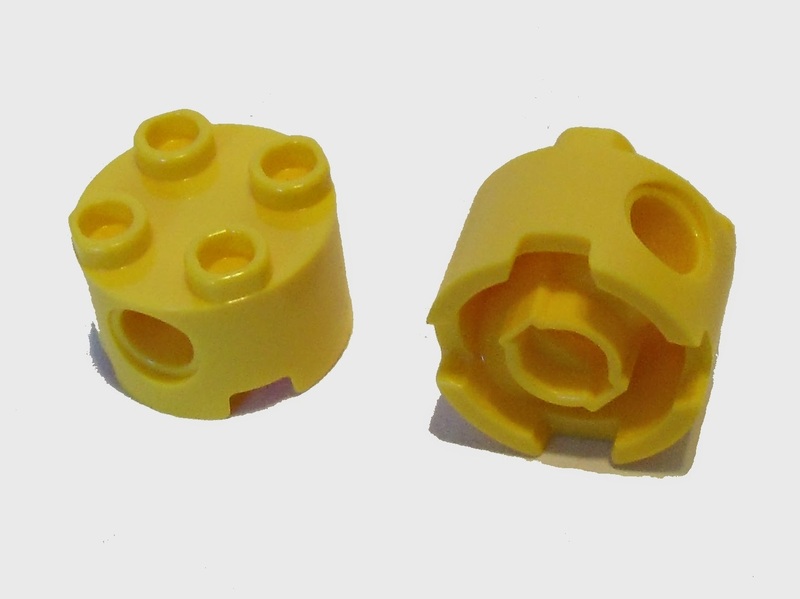 But instead of a normal connection, the brick studs connect to the bottom tubes of the plate. Not revolutionary or breakthrough, but certainly rare in official LEGO models. Not to be confused with 30222. Or 30014; or 4991. This helicopter is the latest model, outfitted with longer rotor blades, a stouter tail, and a sleeker design. But with the cost of upgrades also come some drawbacks. The video camera is now optional. The moveable windshield also suffers in that you can't open it until the rotors come to a complete stop. Otherwise you'll get shattered polycarbonate in your eye. TLG is not shy about repeating City sets. We've gotten over a dozen different police stations and almost as many hospitals. This is the third modern standalone helicopter and one of over a dozen that have appeared in various sets. Apparently the swamp boat and the microlight just were not as popular. As an add-on this is a nice little set. I mean, who's got $60-$100 to drop on a larger set with all sorts of other enhancements? 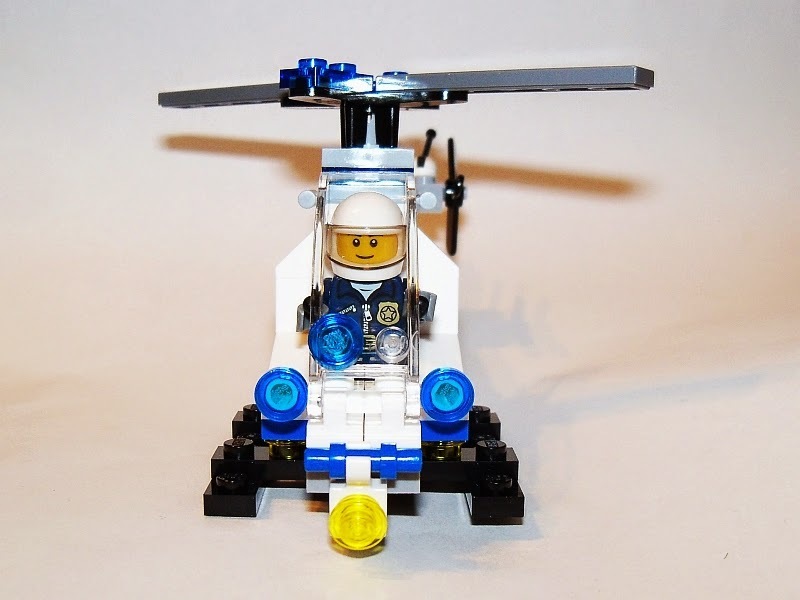 Just rustle up some pocket change and spend $4 on this little guy and you can piecemeal your police force together. As with many of the helicopters, these rotors just aren't long enough. Scaled out, they'd need to be at least 12 studs long each. Here, we have 6. But in this case if the rotors were any longer, they'd chop off the tail. So perhaps a slight redesign would help alleviate that issue. But the rotor engine is nice. It's got some minimal greebling and is more than just a rotor on a stick. I almost feel as if it were modeled after a real life helicopter. Though I have no idea which one as aeromotive vehicles aren't my strong point. I think I've heard the name Sikorsky once. Right now, Target is so stock full of these that they are falling off the point of purchase displays. At 48 + 4 pieces, this is a nice deal for $3.99. I think that's what I paid. Even at $4.99 it still meets the 10c per part nirvana. 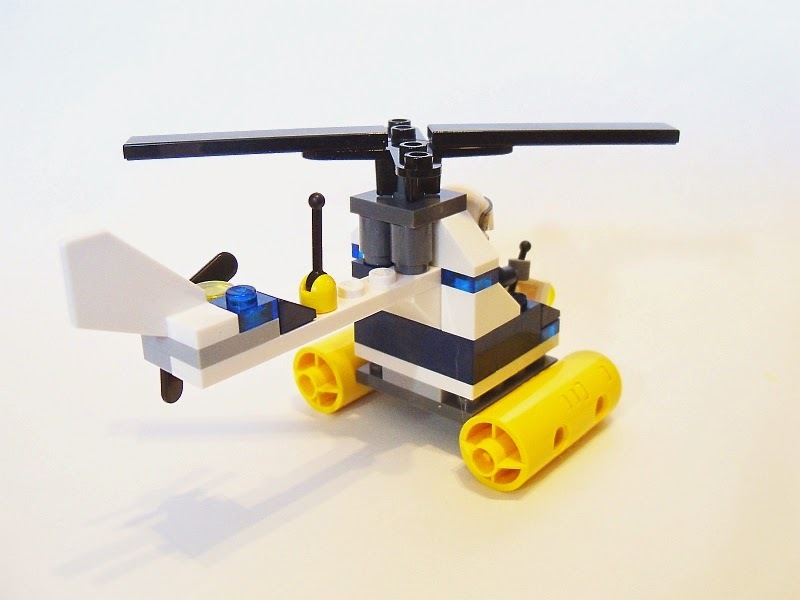 There's a bunch of basic pieces and a few highly specialized helicopter pieces. 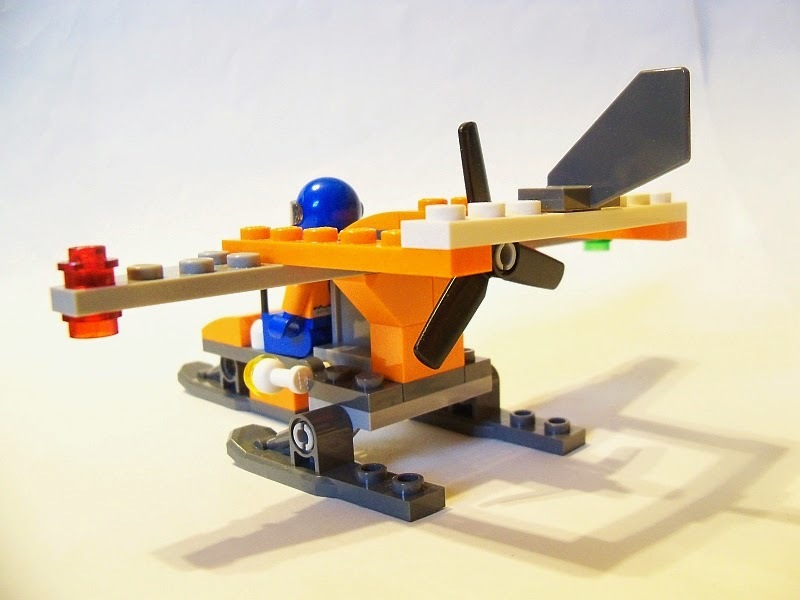 Other than that the landing gear is brick built and there are a couple of blue panels involved. 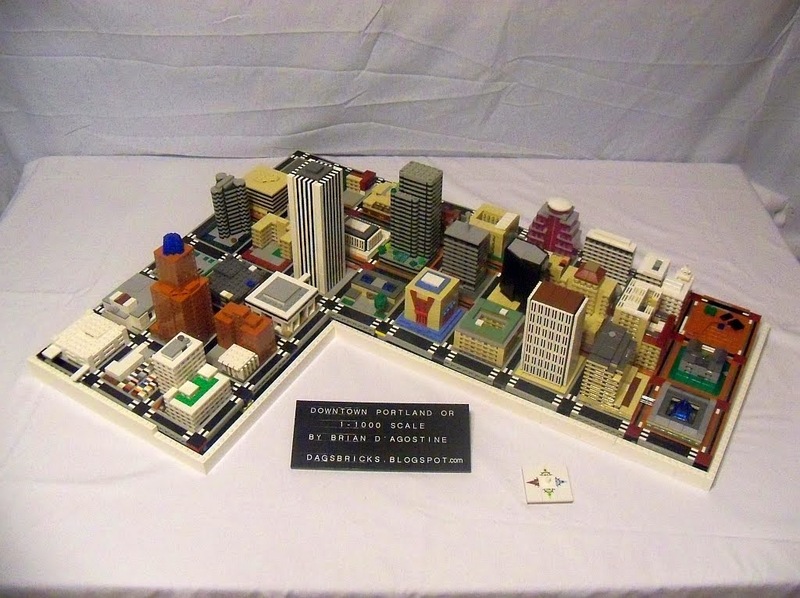 With a little creativity, you could turn 20 of these into a building or something.